After a rather lengthy hiatus, I went shopping for three hours on Friday. After all that browsing, I only ended up buying two shirts and a pair of shoes at Goodwill and two rings at JCPenney (my favorite destination for costume jewelry). At first I lamented the time I had wasted, but after only a few days, I've worn most of the items multiple times. My new conclusion is that I've become a more discerning shopper, so I walk away with smaller but better hauls. That's my story, and I'm sticking to it! 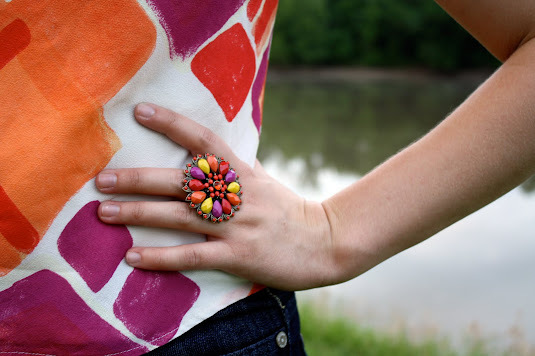 I sported a couple of my fresh finds -- the colorful blouse and perfectly coordinating ring -- for a picnic with friends on Saturday evening. My shorts from last year were a bit snug, but nothing a couple glasses of wine couldn't fix. It was ideal. what a beautiful top and that's such a great cocktail ring!! your outfit is so cute & simple. love it! Love the bag and the blouse! You look like a pretty bag of jelly beans! Gorgeous top! And although I always think you look cute I'm really liking your hair right now. Lovely. You wear colours so well. Also love your photo location! I love the coordinating ring and top! Yay for picnics!